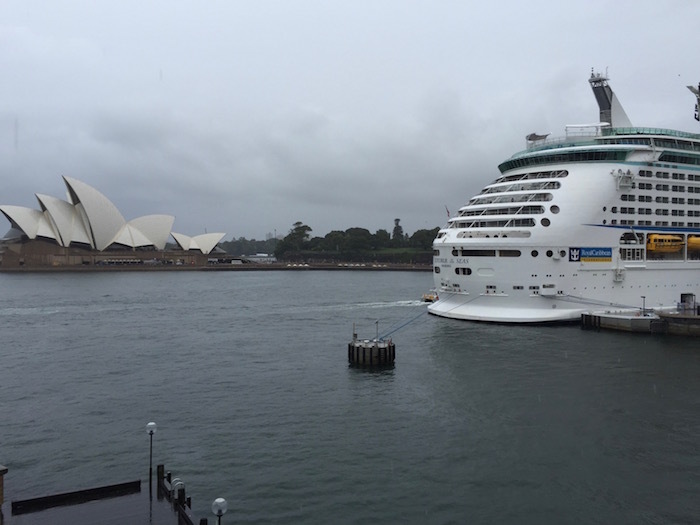 We had just one night in Sydney on the outbound portion of this trip, while enroute to Auckland. As may of you may recall, I took my dad to the Park Hyatt Sydney for his “round” birthday a bit over a year ago, and we had an incredible stay. It’s hands down my favorite Hyatt property, and among my all around favorite hotels in the world. While there are some Park Hyatts that are nice simply because they’re a good use of points, the Park Hyatt Sydney is unarguably the best hotel in all of Sydney, so it’s awesome to be able to redeem points there. I won’t be writing a super extensive review of this stay, since I’ve reviewed the hotel in great detail before. However, we got a different room this time around, so I figured I’d share my thoughts on it. The Park Hyatt had both free night and Points + Cash availability for our night. Since this is a Category 7 hotel, a free night costs either 30,000 Gold Passport points or 15,000 points plus 300USD. While Points + Cash is almost always a good deal when available, Category 7 properties are an exception. You’re basically saving 15,000 points for $300, meaning you’re paying two cents per Gold Passport point. That’s more than I value Hyatt points, since I value them at 1.5 cents each. However, I thought it was worth booking Points + Cash so I would earn elite stay & night credits, which made this worthwhile, in my opinion. We took an Uber from the airport, which took about 20 minutes. Upon pulling up to the hotel we were welcomed by the friendly bellmen and directed into the intimate lobby. The Park Hyatt Sydney feels incredibly residential and understated, and that includes the lobby. Upon presenting our passports we were escorted by the friendly associate to our room on the third floor, so that she could process our in-room check-in. While I had received one of the incredible opera deluxe rooms during my last stay (which is the standard Diamond upgrade, pending availability), this time around they didn’t have any available. That’s perfectly understandable, given that we were staying right after New Year’s in peak season, so I imagine they were almost fully committed. I believe this was a standard room, which is still massive, if you ask me. It was gorgeously furnished, with a king size bed, full size dining table with two chairs, and a small sitting area next to it. The king size bed was comfortable, including the pillows. The sitting area basically featured a loveseat cut in half. Waiting on the dining table was a bottle of champagne (Veuve) and a plate of fruit, which was a generous welcome amenity. The rooms at the Park Hyatt feature semi-private bathrooms, meaning there’s a shield you can pull between the bedroom and bathroom so it’s either exposed or fully private. This is my favorite type of design, since it makes the room feel larger and more spacious without compromising privacy. 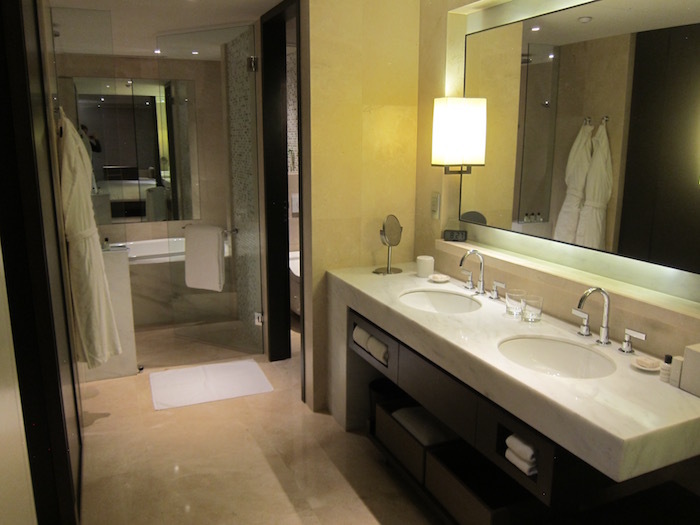 The room featured double sinks, a partitioned off Japanese toilet, and a beautiful shower & tub area. The lovely toiletries at this property are provided by Le Labo. Back near the entrance to the room and across from the bathroom were the minibar and Nespresso machine. 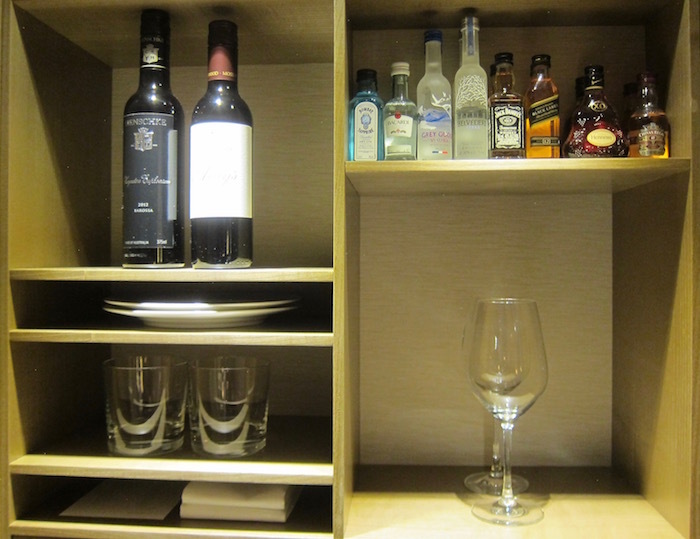 The minibar was well stocked, both in terms of liquor and soft drinks. 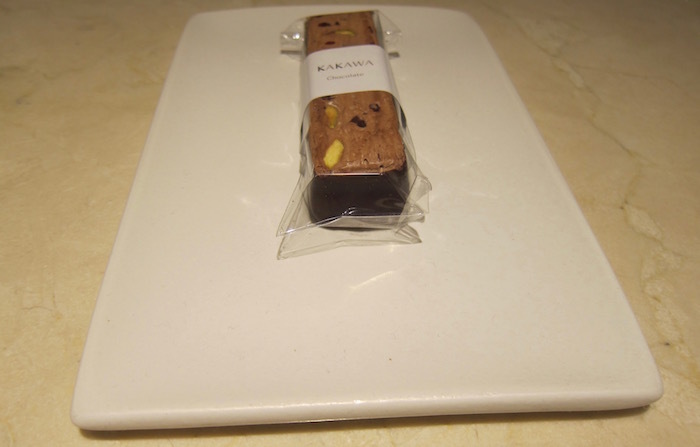 Near the minibar was a tasty chocolate bar, which they seem to place in all the rooms here. They’re sinfully tasty. While my previous room had a breathtaking straight-on view of the Opera House, for this room you had to turn your head to see the Opera House. 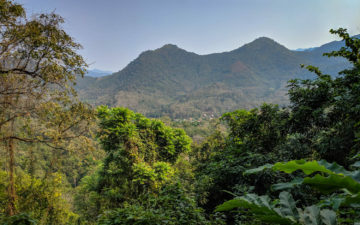 It was located to the far left. Meanwhile if you looked straight ahead you’d see the cruise ships that dock in the harbor almost every day. Then to the right is a view of the rest of the hotel, and even the Sydney Harbour Bridge. The weather in Sydney was horrible the day we were there. It didn’t stop raining, but we still made the most of it. The concierge staff at this hotel are the best out there — Jonathan, Mark, and Robbie, in particular — and they made some great suggestions. We had dinner at Mr. Wong, which was one of my new favorite restaurants in Sydney. We got a good night of sleep, and woke up early the following morning. 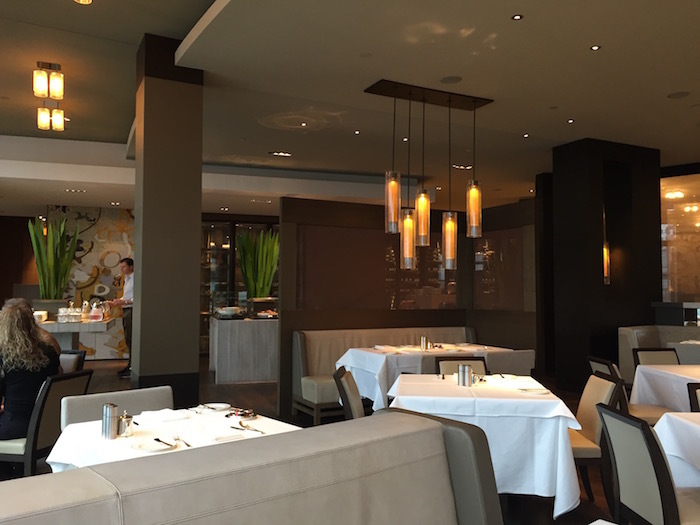 We had breakfast in The Dining Room, which is the Park Hyatt’s main restaurant. It’s located right off the lobby. The restaurant features stunning views of the harbor, so even with the bad weather the views were enjoyable. As a Diamond member you can basically order whatever you’d like. 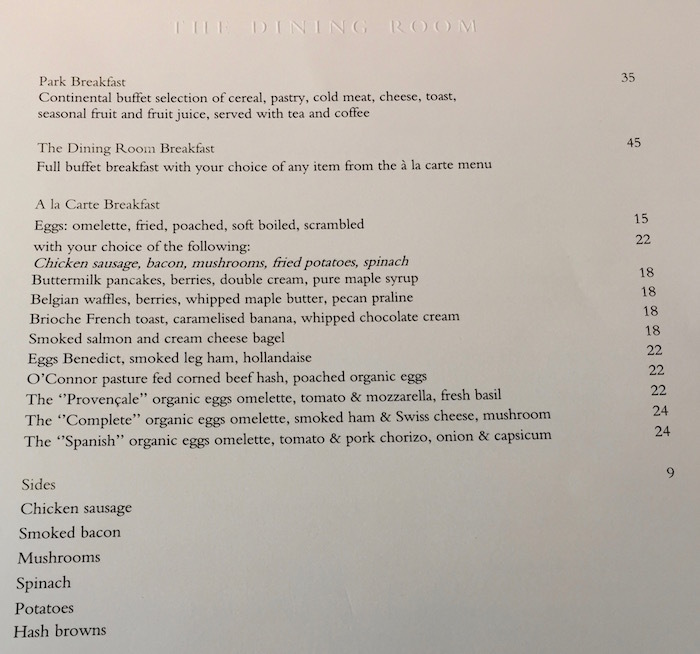 The easiest thing to do is The Dining Room Breakfast, which includes an item from the a la carte menu, and as much as you’d like from the buffet. The buffet isn’t the most extensive out there (in the sense that it’s not some over the top buffet you’d find in Bangkok or Dubai), but the quality of everything is top notch. I had a cappuccino to drink, which was tasty. Meanwhile I had a bagel with smoked salmon. Since our flight was only the following evening, we checked out of the hotel at around 3PM before heading to the airport (and enjoying the Qantas First Class Lounge, of course!). The Park Hyatt Sydney remains my favorite Hyatt property in the world, even when not in the spectacular room I had last time. The standard rooms here are still beautiful and spacious, and the service at this hotel is impeccable. The concierge team at this hotel are the icing on the cake. A Hyatt Regency will be opening in Sydney later this year, though to be honest I have a hard time staying anywhere other than the Park Hyatt using points. My Horrible, Fraudulent Uber Driver — WHAT WAS HE THINKING?! See, I value P&C at this property differently than you. Say the rate is $1200AUD (which it was when I stayed there). You can use 30,000 points, and get $0.04 per point, or you can use P&C, which means you’re using 15000 points to save $867AUD, getting a value of $0.06 per point. Mr. Wong is fantastic, highly recommended. Café Sydney is another good alternative, even only for the view. Have you ever stayed at Peninsula Hong Kong? If so, which one do you prefer since both hotels are about the same price range. Thanks! Don’t you have car service from Etihad? Why Uber? Ben — Thanks for the write-up, and especially the pics. We have 4 free nights scheduled in late October and early November thanks to the Hyatt Visa signup bonus(es). Does every room at the Park Hyatt have a harbor view, or (only) half of the rooms? Jonathan made our PHS stays memorable and amazing. The concierge staff there is truly best-in-class. Looks like this is still an upgraded room. Points stays book into the Park King rooms, which are on the back side of the hotel and face away from the Opera House altogether (and to judge from the pictures, are quite a bit less nicely furnished and not as modern). The hotel doesn’t even sell Park King rooms for cash except during peak periods, so they are only available on points bookings. This looks like it is a City/Harbour King room. Stayed there 3 weeks ago. Frankly we prefer the style Pre-renovation than the current style for both the public area and the room design. We stayed there back in 2007 or 2008, forgot the exact time. The rooms back then felt A Lot More spacious than now. Now it seems overcrowded with furniture. The idea of replacing a good size desk with a dining table is a dumb idea IMO. 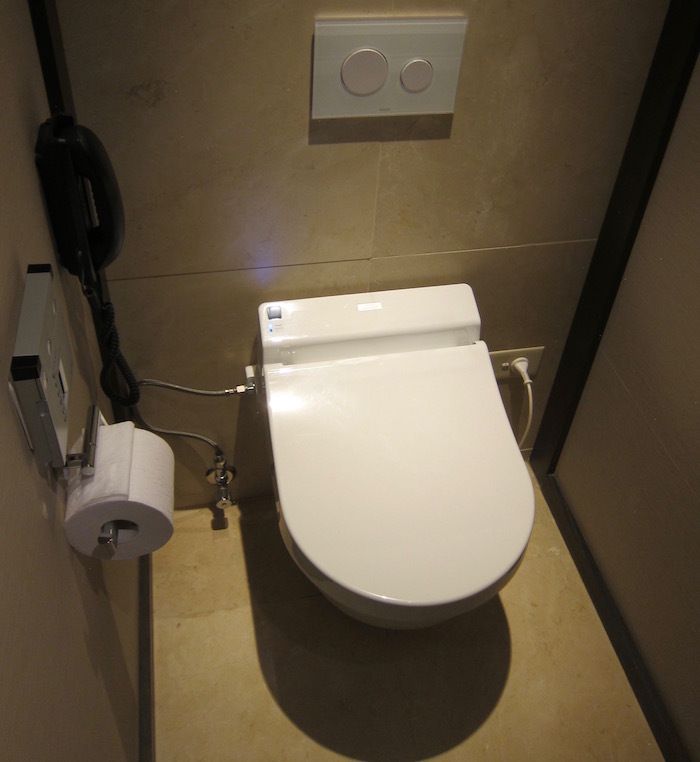 There are plenty of design shortcomings in the current rooms, especially the bathroom set up if you are unfortunately assigned a room that the toilet is OUTSIDE the bathroom at right next to the entrance of the room. This means if you are in the bathroom but suddenly need to use the bathroom, you would have to walk out to the foyer, towards the door then the toilet is next to the door. Very inconvenient. The “Wet Bath” design (without proper separation between Shower and Tub) seems to be unique to Hyatt – we encounter this kind of stupid design in Hyatt Macau, Hyatt Regency Hong Kong and again Park Hyatt Sydney. Hyatt Regency Hong Kong at least has some glass separation to reduce the splashing of water at shower to all over the place. The handheld shower head at Park Hyatt is of unbelievable CHEAP quality even at a 3 star hotel, let alone a hotel routinely charges US$700 and up. Water pressure is very weak also. No place to hang used towels for reuse despite the hotel wants guests to go green. Only 2 small drawers in the room. They cut costs at rebuilding the hotel by not installing drawers and just covering up space with boards – much cheaper than drawers with railings. Another cheap approach. Lighting is too dim for reading anything at night. Lobby is a major drawback from the previous design – before the check in was done at sit down on one side of the spacious lobby – there were 3 desks where the guests would sit down and the agent handling the check in. Then the agent walked you to your room. Now all this space has turned into the restaurant. I understand hotel wants to maximize profit as the restaurants seem always full – many locals use it for special occasions primarily because of the location – but it makes the “lobby” space really crowded if some celebrations would like to take group pictures in that area (so to show off later I suppose). 2 out of the 4 nights when we returned we had to twist and turn to get to the guest elevators (which amazingly has no security feature whatsoever). Bottom Line, if you have not stayed there before the renovation, you do not have any reference. In that case, it is a good hotel but not an outstanding hotel by the standard of “hard product”. However the customer service, i.e. the soft product, are tops. Then the location is excellent for first time visitor though not necessarily the best for visitors who come to Sydney frequently. For convenience on everything, especially good eats, the Darling Harbour location cannot be beat. We will soon be staying there using 4 credit card nights and have Diamond from the big status match, Do you know if we will receive Diamond benefits such as breakfast, upgrade (not DSU) on these free nights? Hand held shower and this is your favorite Park Hyatt in the world? If you get stuck with a Park View room as we did using free nights, the experience will be extremely disappointing. When we booked they were actually selling those rooms for over 600 AUD per night because the hotel was nearly full. I left a review and was told that we would have been upgraded if space were available. For those using your free nights make sure there are harbor side rooms available for an upgrade or cancel your reservation and use the free nights elsewhere. The park rooms are adequate but have no balcony and a view of the underside of the bay bridge. In my opinion not even worth 200 AUD per night! Love Vueve! I can’t wait for my visit in September. My only real problem with this hotel is in the Living Room lounge area. As a hotel guest, I may want to hang out in the afternoon, get a coffee, maybe a glass of wine. But no! This area is fully reserved for Afternoon Tea guests, and hotel guests are kicked out. But sir, you may sit in the bar! Yes, but the bar has no windows, and doesn’t have the view the hotel is well known for. Also, Lounge and Bar service can be a bit slow for the American taste. I stayed at the Park Hyatt about a year ago, and don’t get the excitement about this property. The location is nice if you are staying in Sydney as a tourist, but otherwise it is not ideal due to the lack of transportation options. Otherwise, this is of course a very good hotel, but nothing is over the top spectacular other than the view of the opera house that some of the rooms have. 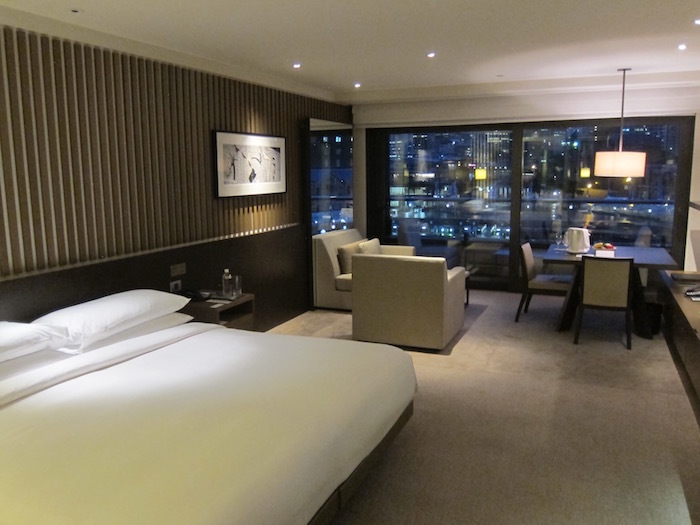 There are many objectively better hotels in Sydney that cost only half (at most). Great review of my favorite hotel. I had a similar room during my visit last year (Harbor Twin, rather than the King). Love this hotel, love the concierge, love everything about Sydney. This really takes me back! sPark Hyatt is pleasant but overpriced, lacking an overall useful location and is post-renovation less comfortably realistic for guests staying more than night. The roof-top pool is noisy and feels slightly forbidding with the bridge overhead. 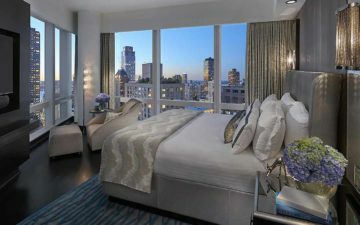 For views, service, access and price our preference is the Shangri-la Sydney.